Eternal Haunted Summer: If you could correct one common misconception about modern Paganism, what would it be? Chastity Heather King: In my opinion it would be that Paganism isn’t a religion. It is one that is most difficult for me to understand. There are always things that people maybe misunderstand about all religions and from those misunderstandings are born misconceptions. A lot of people depend on others to get their information, which in most cases are the people that they are around on a day to day basis, so one misinformed person’s account is taken as a truth. However, the thought that Paganism isn’t a religion, or that religious preference isn’t a right we all share as Americans, is not so easy to understand. America is a free country, founded for this sole purpose. EHS: How do you identify spiritually? Which path or tradition do you follow? CHK: I am of the Christian faith. I observe Christian traditions and holidays. I am non-denominational; this comes from my belief that following a certain denomination is following a person or group’s interpretation of Christianity. If I were to read a book and ten other people read the same book, they would have different interpretations of the text and meaning of the text. I believe that to follow someone else’s understanding of religion is giving up your own beliefs for the those of others. EHS: You recently released your first book, Bloody Gods. Congratulations! Firstly, the book contains two short stories and a poem. How did you decide which pieces to include? CHK: I had just finished “Bloody Gods” and really wanted it to be read. As it was a short story, though, the venues were limited, and the wait time is almost always long for a decision on such a piece. I decided that “Monster in My Closet” was different and showed a somewhat lighter part of my writing, while still sticking to the genre. “Insanity” had been published in Gothic Shadows a month before and is one of my favorite poems; that also fits into the horror genre. With the book containing only two stories, I thought that it would be a perfect piece to break them up while showing yet another type of my writing. 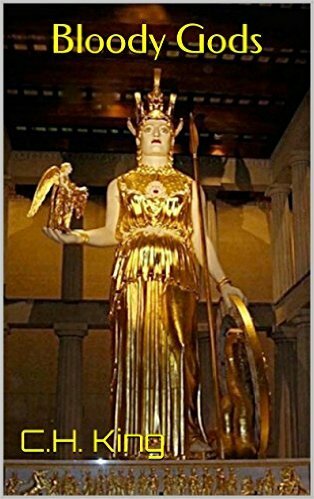 EHS: The cover of Bloody Gods is an image of the statue of Athena in the Nashville Parthenon. Have you ever visited the Parthenon, or do you plan to do so? And what is the significance of that image? CHK: Yes, I visited the Parthenon a few years ago and it was amazing. You don’t realize just how overwhelming her statue is until you are standing in front of it. I spent many hours looking at covers and pictures online and could not find anything that I felt was the cover I wanted. One night, looking at all these pictures, I thought about Athena in the Parthenon, and couldn’t believe it hadn’t occurred to me before. I have a friend that is a great photographer and he happened to have some pictures he had taken of her. I got my brother to edit it for me, and when I saw the finished product, I knew that was the perfect cover; it just fit. EHS: The title story, “Bloody Gods,” focuses on the return of the Greek pantheon. Without giving too much away, can you tell us why the Gods left and why they have chosen to return now? CHK: Well, I don’t think they ever left. In this story, I imagined that they were sitting on Mt. Olympus waiting on the day they would be honored as they once were. I feel like on the timing question, I would have to say, why not? like they just got tired of waiting and said we’ve had enough. I liked making it so unexpected. I thought it gave it more of a rushed and panicked feeling. EHS: The second short story, “Monster In My Closet,” centers around a man who is being “tormented by a supernatural element.” How did you come up with this idea? CHK: That story just started as a paragraph. I actually had a different idea in mind, but after that first paragraph, I felt like I should go another way with it. After changing my first idea, the writing kind of decided which way to go with it. Usually, I do change the direction after I start writing, and I never know how the story will end until I get there, and most of the time I go back and change that. EHS: What draws you to the horror genre? What do you find so compelling about it? CHK: I have always loved horror; it is the only genre that I have ever really gotten into. My mom always had a Stephen King book in her hand, she absolutely loved him, and when I read my first book of his, I just knew that this was the kind of writing that I wanted to read. I was already a big fan of poetry and the dark stuff was and is still my favorite. Reading horror is what made me really want to be a writer; I couldn’t get enough of it. I can’t imagine writing a story that didn’t in some way make people think what if, what if that really happened? There is a lot of that in books, but to me there isn’t any twist that can top the ones you find in a great horror book. EHS: Horror is a popular genre, but Pagan-friendly horror seems to be hard to find. Do you have any that you would recommend? CHK: Actually, I don’t think I’ve read any Pagan horror. I can say that I have read The Iliad and The Odyssey by Homer many times, and though these aren’t really considered horror, they are what made me fascinated by mythology. EHS: What sort of research went into writing these stories? Were you surrounded by stacks of books, or did you hunt for information online, or just let you mind wander? CHK: Actually, these two stories were very much just my mind wandering. I did some research for “Bloody Gods,” but I didn’t use much of it. I had planned on going into more detail of the events in the story and link those events to certain gods. The story went much shorter than I had at first thought, so I didn’t have the room to go into the detail I wanted without rambling. I tend to ramble very much in my writing, getting off subject is easy for me, so after the fourth draft, a lot gets cut out, so that the reader doesn’t think, what is this, where’s she going with this? EHS: Where can curious readers find Bloody Gods? CHK: Bloody Gods is available on Kindle, available through Amazon under the name C.H. King. EHS: What advice can you offer other writers who are putting together their own manuscripts? Steps they must take? Mistakes to avoid? CHK: As far as advice, I am still learning so much, but the things I have learned so far are 1) Get someone to read it: the more people the better. 2) Read it out loud, until you’re tired of it. 3) Do at least four or five drafts, and whatever you do get someone to edit it for you. I thought that I knew everything about writing. I did not. I had a lot of run-on sentences, partial sentences, so on and so on. Just because you love the way you put words together, does not mean that may not be hard for someone else to understand what you are saying, and they will lose interest. 4) Also, make sure that you have a really good start: if you do not, readers may put your book down before they even have a chance to get into it. CHK: As of right now, I don’t have anything planned as far as conventions or book fairs. I am, at this time, spending any free time I have working on my writing and ways to improve it. CHK: I am working on a couple of things actually. I am writing the story that I was researching when I wrote “Fenrir’s Pain.” It is a book that works some of the Fenrir mythology into it. I am working on a couple short stories as well. I always have a couple of things going. If I get to a place that I keep getting blocked on a story then I always put it aside for a while and either write a poem or work some on another project — that way I work through being blocked, but I still writing so that I don’t get so blocked that it’s hard to start again.